Injustice: Gods Among Us was a big hit of a console game, and especially endearing to fans of the source material from the DC Universe. And like any comics-related property, a hit gets a sequel, expected for release in 2017 on PS4 and Xbox One. This has been a banner week for tidbits regarding what Injustice 2: improvements, gameplay changes, and some roster info. With the release of a gameplay video and reporting from E3, here’s a roundup of what we know so far. Only six confirmed so far: Supergirl, Aquaman, Gorilla Grodd, Batman, Superman, and Atrocitus (the monstrous leader of the Red Lanterns, whose rings are powered by rage). Notably, Atrocitus seems to be accompanied by Red Lantern cat and fan favorite Dex-Starr, perhaps in a similar manner to how General Zod can sic a wraith from the Phantom Zone on opponents in the original Injustice. 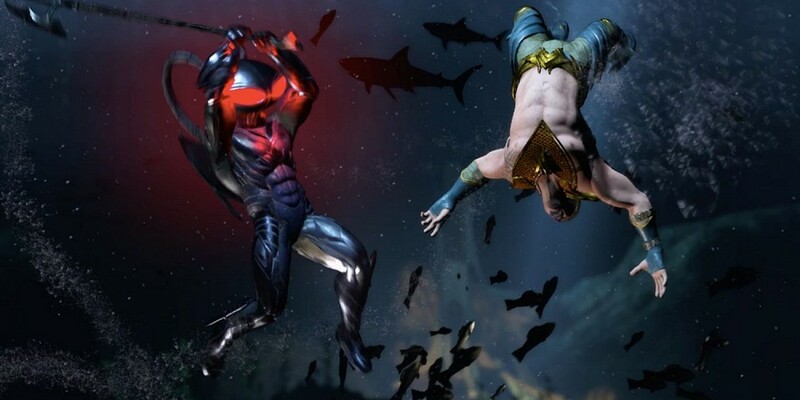 We have also briefly seen Black Manta. At Superherohype, Spencer Perry writes that there were 28 character slots during his play-testing, with most of the characters in silhouettes, but a company rep informed to him that this was by no means an indicator of the final tally (whether more or less, but since the original has 30 characters including bonus DLC, we’re prejudiced toward believing there will be more than that). Boon referenced that tournament play would have some kind of balancing factor – something to make the guy with the level 20 Batman competitive with the level 50 Batman, for instance – but didn’t reveal anything tangible about how that would be enabled. — Some of the pre-fight scenes, with characters taunting or threatening each other, etc., were generic in the first one, and some were customized when certain characters came face to face. The preview video we’re seeing thus far indicates more of the custom interactions depending on who is fighting who versus the generic stuff. Like when Supergirl asks is Atrocitus intends to spit up on her, like a baby (which he does during the gameplay sequence, yuck). What else will we see from DC’s fast and furious fighting game? We’re hoping the company dips further into the weirdness – more Zatanna (who was in the first game) and that ilk, maybe Etrigan, Enchantress, or even – how the heck would this work? – John Constantine. Or maybe some Injustice-Dark version of goofy Silver Age stuff, like Bat-Mite, Elongated Man, and Bizarro. We’re sure reveals will come constantly from this point forward; after all, 2017 isn’t that far off. Check out the official gameplay teaser below!